Madness had finally broken through to America and Frank Zappa put out a fantastic album but if there was any more proof needed to forward the belief that 1983 was a good year for humour in music, it would be the debut album of Weird Al Yankovic. In fact, since this year, many people would forever compare Weird Al with Frank on account of their love of humour. So much so, that twenty years after this album, Weird Al would have a track on an album that if you didn’t know any better, you would think it was Zappa himself. As for me though, it would only be the humour and the fact that both are true musical geniuses being the only things they have in common. They have totally different styles. Hearing the tracks “Ricky” and “Stop Dragging My Car Around” on the radio in the spring of this year would convert me to Weird Al forever and I don’t care if people think I’m sad for it, (some do.) Those songs had me rolling on the floor in laughter and when I heard it, so did the self titled debut album. Nobody, now or then, does parody better than he does. What’s even more impressive is how he is able to adjust to the musical style of the song he’s parodying even if he sometimes does it with an accordion. That’s another amazing thing about him, no one else has been able to employ an accordion in rock songs the way he does. On the debut album, the parodies come thick and fast. Not only do many of them take the piss out of classic songs, they are also parody other things. Take the two already mentioned. “Ricky” is obviously a parody of one hit wonder Toni Basil’s “Mickey” but it also parodies the old “I Love Lucy” show. Same with “Stop Dragging My Car Around.” Yes, it’s a humourous version of the classic Tom Petty/Stevie Nicks duet “Stop Dragging My Heart Around,” but it also rips on the the culture of towing cars away. Other great ones are “Another One Rides the Bus,” which is a parody of a Queen classic and if you have ever ridden on a crowded bus, then you would appreciate the sentiments on this song. Others great parodies are “My Bologna” which pokes fun at The Knack’s “My Sharona and “I Love Rocky Road,” a dig at the famous Joan Jett and the Blackhearts song. However, not all of Weird Al’s songs parody other songs. Some are just simple digs about other things. “Buckingham Blues” makes fun of the Royal Family. “I’ll Be Mellow When I’m Dead” is a dig at the hippy culture. Then there’s “Gotta Boogie,” let me just say this song has nothing to do with dancing. In any case, unless you have no sense of humour at all, and there are people out there who do, you can’t stop laughing out loud at the songs from this album. Weird Al proves to the world just how weird he is. 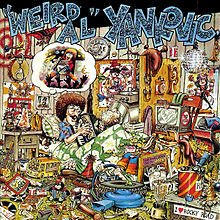 Weird Al Yankovic, along with Frank Zappa of course, proved to the world in 1983 that humour and music could go together. The debut album from Weird Al continues to have me in stitches each time listen to it. This entry was posted on December 11, 2015 at 5:03 am and is filed under 1980s, Humour, Music, Rock, Uncategorized with tags Classic Rock, Frank Zappa, humour, Joan Jett and the Blackhearts, Madness, one hit wonders, parody, Queen, Stevie Nicks, The 1980s, The Knack, Tom Petty and the Heartbreakers, Weird Al Yankovic. You can follow any responses to this entry through the RSS 2.0 feed. You can leave a response, or trackback from your own site.